As technology continues to evolve and take over the workplace, the need for On Demand Training has also prevailed. Modern learners know what they need to perform better and On Demand Training supports this by focusing on context and productivity. On Demand Training is a strategy that involves providing learning solutions in real-time, anywhere and at any time. When used in the right way, it can lead to higher engagement, performance, and productivity (just to name a few). 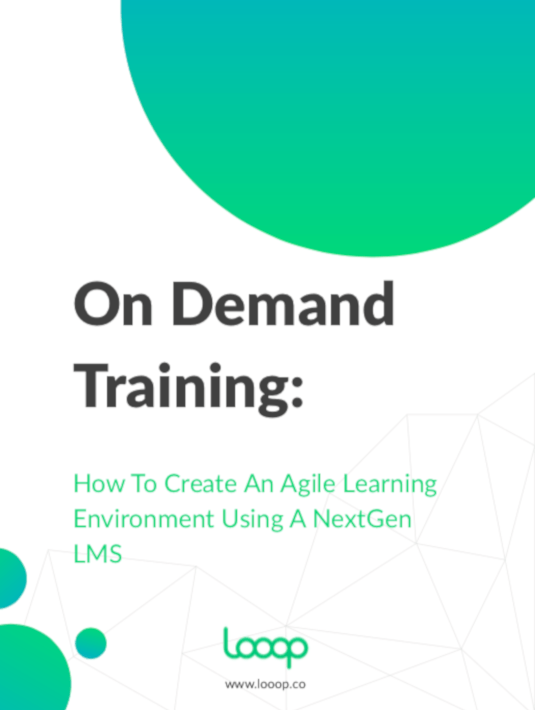 This eBook looks at why On Demand Training exists, what your On Demand Training program should include, and how a NextGen LMS can support you in the process. What Is On Demand Training And Why Should You Use It In Your Organisation? On Demand Training can be defined as a training method that enables learners to access to useful information in real time, anywhere and anytime. This chapter looks at the benefits and why should you use it in your organisation. Is On Demand Training The Right Choice For Your Organisation? Digital transformation has completely altered the way we learn at work and our relationship with technology. So how do you know if On Demand Training is the right choice for your organisation? Thanks to the ongoing advances in digital, it is now easier than ever to give your employees valuable information when they most need it. While much has been written about what you can do with technology, there is very little information on the benefits you can expect from making the change. Many businesses find themselves failing to create a training program that works before they’ve even really begun. This chapter explores some of the common mistakes to avoid. Whilst On Demand Training Programs are far more affordable than traditional LMSs, there are still factors businesses need to consider when creating or choosing their software. With the workforce becoming more digitally capable and looking to take control of their own learning, it’s important to choose the best possible LMS to support the modern learner. Choosing the right LMS requires careful planning and consideration of your training needs. This chapter explores the features that we believe every LMS should have to best support your employees and improve your On Demand Training Program. As employees become more digitally capable, so should L&D. The next generation of learning platforms support On Demand Training by addressing the real-life problems and solutions your employees require, at their points of need. Given the key role your LMS platform will play in delivering on the promise of resource-based training, it's important to set up a clear structure to evaluate your options before you get stuck into creating your program. The days of proving training effectiveness using soft measures is over. As business moves into the age of big data, L&D needs to up it’s game and get comfortable with the new tools of the data-driven business. Why is Looop The Best Solution For Your Organisation? Looop has been striving to create the very best NextGen LMS around, built to meet the needs of today’s employees. What is the secret sauce that will help you and your organisation support your people, their performance and productivity? This chapter explores what sets Looop apart from the rest. Built for the modern workforce, Looop gives businesses the tools they need to best equip their staff to perform better and faster in their roles. This chapter outlines what we believe are the key practices you can use today to get the best out of your next Looop initiative. Learning and Development (L&D) teams need to support employees to achieve ‘better doing’ rather than only addressing ‘learning’ outcomes. If you take the question “what is On Demand Training” to be an easy one, you either have plenty of experience in developing and offering On Demand Training courses, or lack of interest on the field. If none of the above describes you, and you want to learn about On Demand Training, then this eBook by Looop will become your loyal companion and provide you with all the answers you seek. Upon reading it, you will find out if this is the right choice for your organization, what kind of LMS will suit you best, what mistakes you should avoid, and many best practices to fully deploy On Demand Training in a modern workplace, boosting engagement, performance, and productivity.